I really wanted to bake something new today. Something breakfasty, but dessert-like. Oh, and healthy too. What? OK, maybe this really isn't too healthy, but it feels "good for you" while you are eating it. It's loaded with antioxidants (cranberry and orange), plus it has oatmeal in it, which we all know helps to lower cholesterol. Woo hoo! So, I'd really like to focus on recipe creation for this post. What goes into your favorite baked goods? And how much? A basic rule for making baked goods is that approximately 1 cup of flour will create one 8" cake layer. Remember, though, that cakes are light and fluffy and soft, but scones are supposed to be thick and dense. We're gonna need at least double the flour. Since about 8 scones would equal the size of a layer of cake (and we're making 16 scones), we'll start with 4 cups of flour. If you want to use some whole wheat flour, please do, but I generally don't go with more than 50% of the total flour in the recipe. 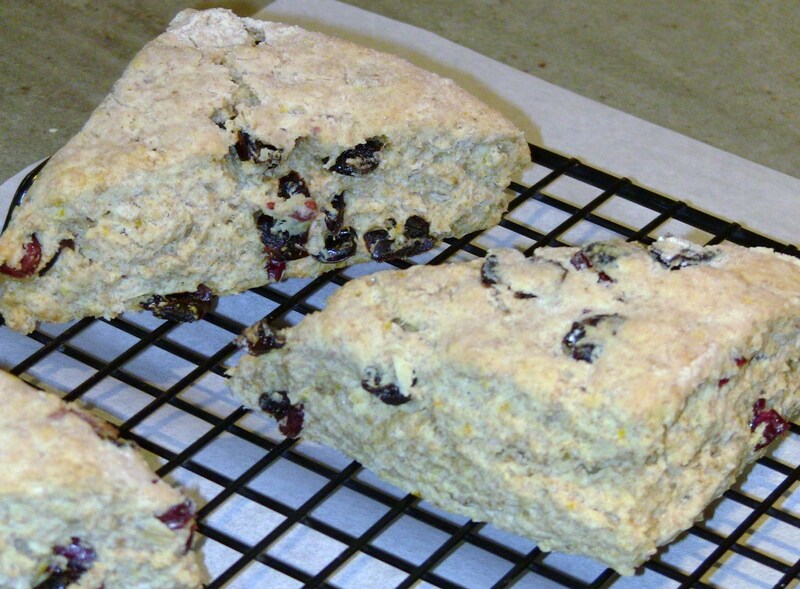 A cup of oats helps to give these scones a "homey" feel, but you can leave them out if you'd like. Moving on to the sugar...Scones really aren't supposed to be too sweet. Often, a scone will be brushed with something (like cream or egg) before baking, and some coarse sugar sprinkled on top. Or, you can get really sassy and glaze them like I did here. 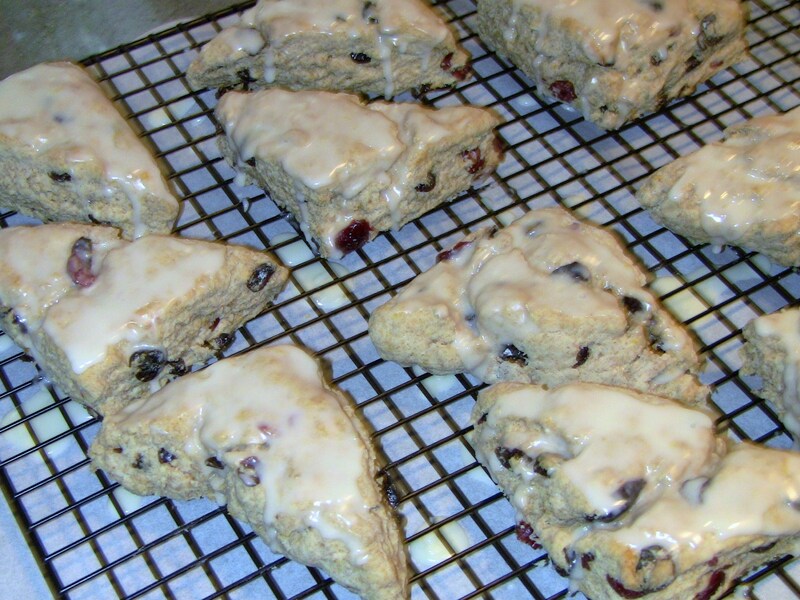 Glaze can be spooned on top or drizzled across the scones. But, back to the recipe, I included a few tablespoons of sugar, but those of you who like a sweeter scone may want to increase to 1/4 cup. Baking powder and salt are needed for rise, generally up to a teaspoon is fine for a cake, but since biscuits and scones do not rely on whipping eggs for rise, you will want to add more. Two tablespoons should be fine for this recipe. Baking soda is used when baking with cocoa or yogurt, which are acidic. Since baking soda is pure sodium bicarbonate (a base), it requires an acid of some kind in order to produce the reaction which causes the rise. In a pinch, you could use baking powder instead of baking soda (since baking powder contains an acid already), but you'd never want to use baking soda in place of baking powder in a recipe. Butter is a tenderizer and should be blended into the dry ingredients in order to form layers in the final product. This thinly blended butter (and occasional larger chunks) is what leads to super-flakiness in scones or biscuits. A (well-publicized) secret tip is to avoid mixing too much, because you don't want the butter to blend in homogeneously into the ingredients. Finally, to add liquids to this recipe, you really need to just feel it out. 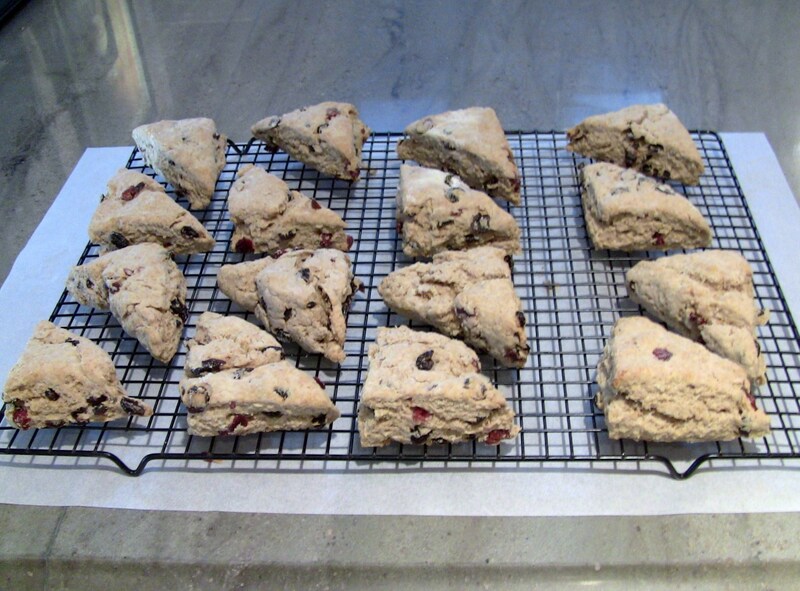 Scone batter/dough must remain thick (never pourable), so liquid should be kept to a minimum. I had 2 extra egg yolks on hand, so I mixed those with 4 eggs and a half cup of buttermilk, since I was out of cream. Since I ended up using buttermilk (an acid), I could have opted to go half and half on baking powder / baking soda. But, baking powder is fairly neutral, so the end result likely just leaves these scones with a little bit of a buttermilk taste (rather than a bitterness caused by too much alkali). To add flavor, I used the zest of one large orange and a large handful of dried cranberries. Anytime you create a recipe from scratch, you will need to be aware of the texture of your creation as it's being made (does this seem right? too thin? too thick?) and can be adjusted as you go with the addition of more/less of the above categories of ingredients. If all else fails, just make sure you write it down, figure out how you feel about the final product and adjust the recipe the next time you make it to account for the flaws. With this recipe, I was pretty pleased with the outcome. Next time, though, I'd lessen the flour content a little in light of the oats and try cream instead of the buttermilk. Mix together the flours, sugar, salt, baking powder and oats. Using your fingers (or the low setting and the paddle on your stand mixer), blend the butter into the dry mixture until it is mostly blended in, but some small chunks remain. Whisk together the eggs/yolks, zest and the buttermilk and add in to the dry ingredients. Mix on low just until blended. Add in cranberries. On a well-floured surface, press the dough lightly into a square, not more than 1” high. It’s a good idea to square off the corners of the dough very well. I do this using a floured pastry bench scraper. If you don’t square off all edges, these end scones will not be as well-shaped as the interior cut scones. Cut the square into fourths, then each fourth into fourths, using the pattern on the attached recipe. A bench scraper is probably sharp enough to do the cutting, but you can use a floured knife as well. Move the scones to a parchment-lined baking sheet and bake at 400°F for 25 minutes. Glaze with orange glaze (1 c powdered sugar + 1-2 T orange juice) once cooled.